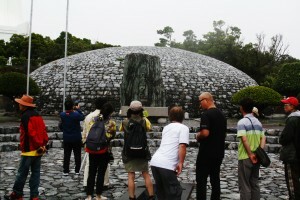 We, people who fight against naval base construction in Gangjeong village, Jeju Island, South Korea, want to stand together with Okinawa people on June 23rd to memorize, to reflect and to feel the pain and shame together that how we humans allowed ourselves to walk on the way of war preparation and to dehumanize each other under the war. We don’t want this kind of tragedies to be repeated. However, we recognize that now the atmosphere in East Asia is very similar with that before WW2. Under the US strategy of Asia pivot, our island, Jeju, is also being further militarized, which means the value of Island of World Peace gained over the pain of 43 has been reversed by the nationalism, US militarism, and a long tradition of difficulties as the border islands. Your island, Okinawa, not to mention the long struggle against the US bases, is also facing the new tide of militarization even by the Japan Self-Defense Force, which indicates the painful lessons which supposed to be learned from the WW2 and battle of Okinawa have been diluted by the nationalism, US militarism, and a long tradition of difficulties as the border islands too. We recognize your effort to stand up against war in the memorable day on June 23rd as here in Jeju, we also don’t want our historical lessons to be twisted. If we Jeju islanders choose the way of development with military base and feel the necessity for national security, we are alarmed that we might already be on the way which led to the experiences of Battle of Okinawa. 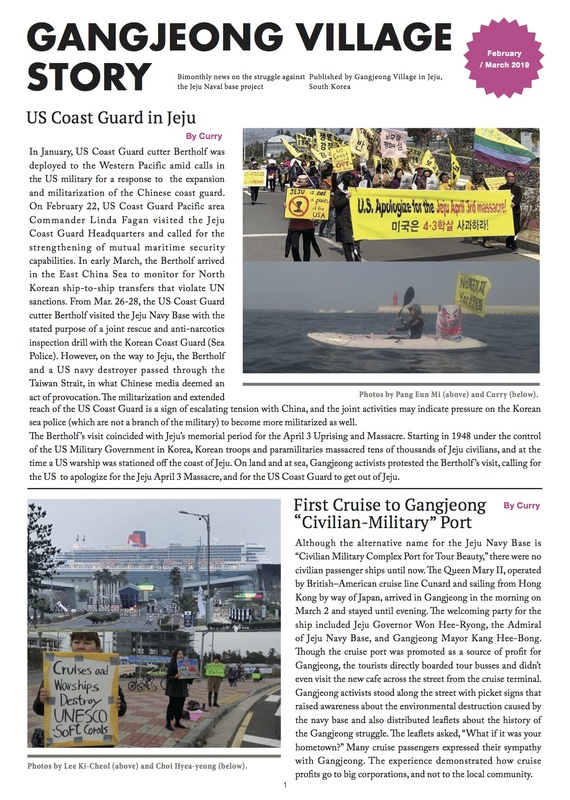 Some argue that Jeju Naval Base is not US Base, but we are aware that US militarism trickily makes a use on the nationalism as we couldn’t yet overcome lots of disputed islands in our region. Under both US militarism and our nationalism, our islands, Jeju and Okinawa, are overwhelmed by double centers, US and our own center governments, to defend for. We are alarmed that could lead to the result of another present experience of Battle of Okinawa, a more complex mode with double centers. We appreciate your continuous effort to remind the war memory on the date of 6/23. The peace wind today already blow to our village, and we want to blow this peace wind to all the coner of our island. Base is Base. There’s no difference between your base and our base because there’s no difference between your peace and our peace. The peaceful lives which we want to sustain in our island is the same with yours. That’s why we are in solidarity with your peace action, and we also want to actively invite you to come to our beautiful Gangjeong village, Jeju Island anytime, especially on this August 3-6 to join to the Peace for the Sea International Peace Camp building not only solidarity but also action plan for peace in our region.